Going back to school is a lot more fun when you know you have the tools to learn. Students in advanced classes may also receive calculators or other course specific material. During the school year, WRHM has supplies available to replenish any needed materials. Backpacks and school supplies are donated through school supply drives by the local community organizations and supporting churches. To donate or organize a school supply drive, please call the office at 314 961 5082. 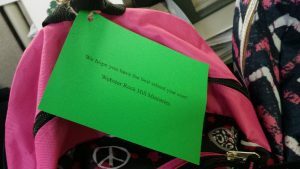 Students (or parents or students) interested in receiving a backpack should contact the office at 314 961 5082.